Bourton House Garden GardenBourton House Garden opened to the public for the first time on a single Sunday in 1987 in aid of the National Garden Scheme. Twenty years later, the garden received the prestigious HHA/Christie’s ‘Garden of the Year’ Award, a tribute to the inspiration (and perspiration!) of everyone involved in its creation over the years. In 1983, Mr & Mrs R Paice became the owners of Bourton House and began the task of turning a neglected wilderness into the perfect garden setting for the courtyard of ancient Cotswold stone buildings. Over the years, the garden evolved, new projects were planned and new challenges faced. They were fortunate to have the help of a splendid gardening team, originally headed by Paul Williams followed in 1999 by Paul Nicholls, our current long-serving Head Gardener. Imaginative topiary was introduced including a knot garden, parterre and topiary walk; natural springs used to create water features; an unusual shade house constructed and ever wider herbaceous borders created to accommodate more exotica. Today, the garden continues to evolve, constantly surprising visitors with its inspirational planting, stunning colour combinations and rare, unusual and exotic plants. Bourton House Garden opened to the public for the first time on a single Sunday in 1987 in aid of the National Garden Scheme. 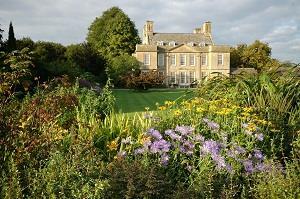 Twenty years later, the garden received the prestigious HHA/Christie’s ‘Garden of the Year’ Award. 1 Apr-31 Oct: Wed, Thur & Fri (excluding Easter and BH) 10am-5pm. Admission £6, under 16’s free. Please see website for further details.